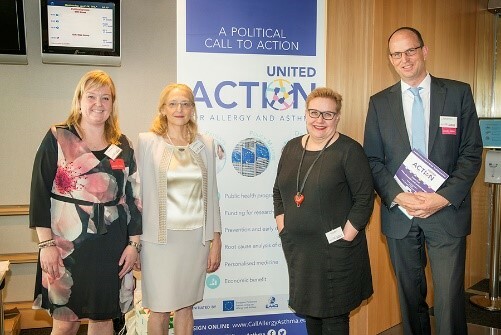 The European Parliament Interest Group, EAACI and EFA launched the European political Call to Action “United Action for Allergy and Asthma” in April 2017 during a policy event in the European Parliament (Brussels). 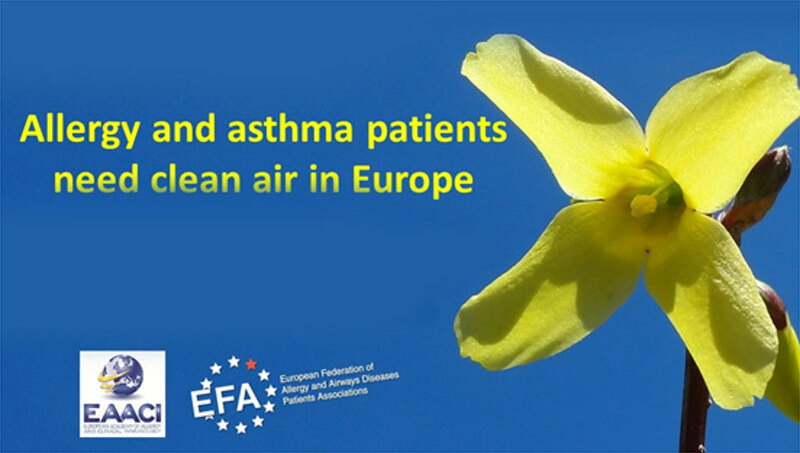 The Call to Action was promoted via a pan-European advocacy campaign uniting all strategic European and national stakeholders as well as interested individuals to help drive action and policy responses to allergy and asthma, in support of patients’ rights. In only five months, the campaign secured broad endorsement and received ample coverage in the European press. It was supported by nearly 190 national and European organisations, more than 5,000 individuals from across Europe and over 32 policy-makers. 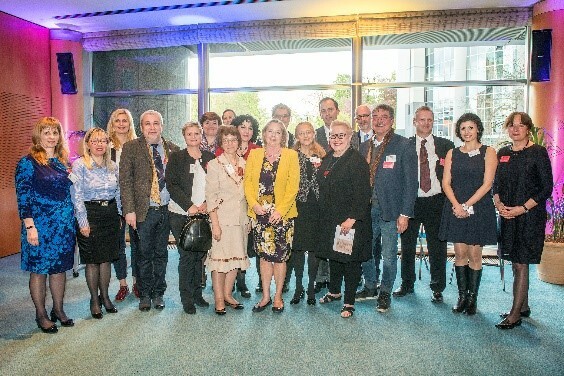 With the support of EFA, EAACI and 7 other European health and respiratory organisations, 12 members of the Interest Group and colleagues tabled a written declaration on Chronic Respiratory Diseases in the European Parliament in autumn 2016, calling on the European Council and the European Commission to act for better prevention, diagnosis, care and rehabilitation in Chronic Respiratory Diseases. The Declaration was supported by over 250 Members of the European Parliament from 26 EU countries. The “United Action for Allergy and Asthma” pan-European campaign (more information in “legislative and policy actions”) was launched during a two-hour policy discussion that gathered over 90 participants in the European Parliament, with interventions by representatives of the European Commission, the Finnish National Institute for Health and Welfare, respiratory doctors and allergy/asthma patients. Hosted by the co-chair of the Interest Group, Sirpa Pietikäinen (Finland, EPP group), and group members Nathalie Griesbeck (France, ALDE group) and Karin Kadenbach (Austria, S&D group), the event was opportunity to discuss the benefits of prevention, good practice examples in addressing allergy and asthma, and measures to drive improvements in care. The Interest Group on Allergy and Asthma convened a three-day exhibition in the European Parliament in Brussels “Test Your Allergies 2016” including allergy testing sessions and a policy event on “Allergy at the forefront of EU Chronic Diseases Policy: The road towards better prevention and management of Allergy in Europe”. Nearly 400 people got skin prick tested for allergies and visited the exhibition site, including 17 Members of the European Parliament and European Union officials. The initiative successfully achieved its aim to raise awareness on the burden of allergies in Europe amongst EU policy-makers and the broader European civil society. In the context of the review of the EU National Emissions Ceiling (NEC) Directive, the Interest Group, EAACI and EFA organized a policy meeting to discuss and debate the ongoing EU efforts to review clean air legislations in Europe. The meeting welcomed patients’ representatives, medical specialists, academia and industry as well as representatives from the World Health Organisation (WHO), the European Commission, the European Parliament, the European Economic and Social Committee (EESC) and health and environment organisations. This meeting in the European Parliament marked the start of the activities of the Interest Group, articulated around the aims to provide a strong and unified contribution to EU policies on allergy and asthma health, chronic diseases, air pollution, and research among others; while raising awareness of the growing incidence of asthma and allergy in Europe and developing a network of MEP ambassadors supportive of increased research on allergy and asthma prevention, treatment and management. The European Parliament Interest Group launched a blueprint on the 20th of March 2019 in the European Parliament. The Interest Group blueprint pinpoints the links between allergy and asthma and industry sectors such as transport, the environment, agriculture, food and consumer products. While focusing also on the links with research and digital technologies, the Blueprint recommends establishing European Centers of Excellence to help improving patient’s quality of life through programmes and best practices. It reiterates the groups’ commitment to forward-looking EU policies in prevention, care and research for the benefit of people living with allergies and asthma in Europe; and sets the tone for potential work areas of the Interest Group after the EU elections in May. The blueprint is accompanied by an "achievements" paper which provides an overview of the main policy milestones and work of the Interest Group in 2015-2019.